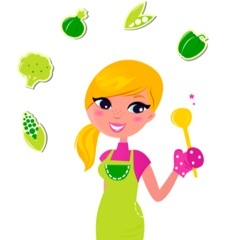 Mommy and Baby food: Win 2 Tickets to Babes & Babies a San Francisco Event for Moms and Tots! 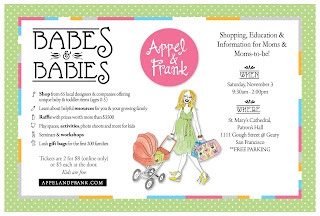 Win 2 Tickets to Babes & Babies a San Francisco Event for Moms and Tots! Attention Bay Area Moms! 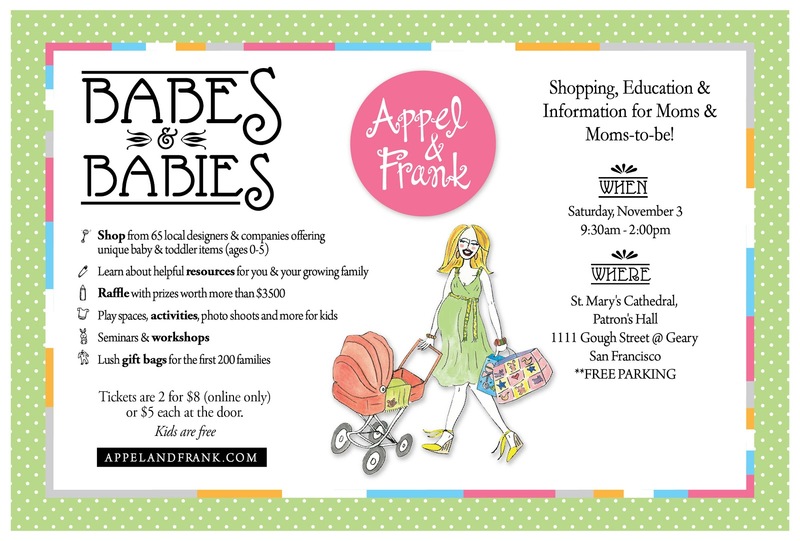 Mommy and Baby Food is teaming up with Appel & Frank to giveaway 2 pairs of tickets to their Babes & Babies event Saturday November 3rd in San Francisco! To enter visit my facebook page here and leave a comment under the Babes & Babies post about the moment you first felt like a mom. If you are a mom to be share your favorite pregnancy moment so far. One comment per entry. Contest ends Sunday 10/21/12. Good luck! Moms are invited to shop from 65 designers and companies offering baby and toddler clothing, accessories, gear, toys, local resources and much more...at discounted prices. There will be free speakers and seminars on topics including sleep training, cord blood registry, hiring a caregiver and more! Additionally, there will be lush gift bags for the first 200 families, on-site photo shoots, play spaces & activities for kids run by MyGym and Peekadoodle, as well as a raffle with incredible prizes, including a Stokke highchair, Joovy Stroller and a Medela Pump in Style Breastpump! The event will be held on Saturday, November 3rd from 9:30am - 2:00pm at the St. Mary's Cathedral, Patron's Hall (1111 Gough Street @ Geary) in San Francisco. Admission is 2 for $8 at appelandfrank.com or $5 each or at the door. I must admit, I want my son to have very lots of childrens rashies that are vibrant and full of colors! You probably already know a few things about babies. Most people know that it takes babies a while to get to know someone. You probably have been taught that a baby instinctively knows who his mother is almost as soon as he or she is born.